You are currently browsing the archives for the Vanity Lights category. If your bathroom doesn’t have a skylight or large windows, it lacks natural light, which is the best for shaving and applying makeup. Some artificial lights have an unflattering, yellowish tinge to them, making you look sickly and tired in your own bathroom. To start your days off right, you should invest in soft white bulbs for a flattering glow. 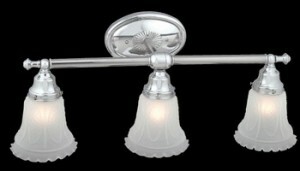 If your bathroom light fixtures are the problem, they may need to be replaced. Installing new vanity lights can make a world of difference in your bathroom. The more light you have, the better, so replacing a single light with a row of three or four would be a monumental improvement. Make sure the fixtures are made of white frosted glass, not yellow, so they cast out a soft, flattering glow. Repainting your bathroom with a warm color, like a soft blush or beige, can also do wonders for your complexion.